Everything in the Universe, including the Universe, was born, has evolved over time, and is in a state of constant evolution until it's destruction or ultimate death. Evolution of the material is the most obvious but mind and even soul have gone through this process and will continue in the same fashion. There was a time in our distant past when we were in a perfect state of Oneness - a Oneness of mind, body, and soul. In this perfect state, there was no duality, only Oneness - a Oneness of All. This was a state of total Bliss and harmony. Then at some moment long, long ago, evolution made itself known and a part of mind unknown until that moment, broke through our Collective Unconscious and forever shattered our pristine Paradise. This part of mind is Ego. This has been written about in many cultures as the moment we lost Paradise, or lost our Innocence. In Biblical terms, we "ate the fruit of knowledge" and "God" kicked our collective, but now individual, butts out of the Garden of Eden - ie, Paradise. It was at this moment, according to the Bible, that we realized we were naked for the first time. There was now a separate you and a separate me, and, we were horrified! Well, I believe the Bible says, embarrassed, but I think something more dramatic is called for at this particular point - this birth of all things Evil. Yes, I used the word "Evil". How about the word "Satan"! Does that give you a better idea of the magnitude of this event? It was the worst moment in our entire existence. Now, do not think for a moment that some fiery-red dude with horns, a pointy tail, and a pitchfork appeared. No, nothing so fictionally dramatic like that happened then, or ever for that matter. The actual definition of the word "satan" is: Satan(noun)from Hebrew,satan,"adversary"the Devil,the Tempter,the Chief Rebel against God mentioned in the Bible* This truth is so obvious once you understand that our Source is pure Love, altruistic Love, and then you realize that all selfish, unkind, cruel, and evil thoughts and actions originate from the thinking, scheming, and self-gratifying Ego. When Ego emerged, it emerged as the adversary to our Source, God, True Nature, Self, et al. This was the initial separation of self (individual) from Self (collective whole or Oneness) and dualism was created by Ego in order to manifest this illusion of self** or separateness. In order for a separate "I", "Me", "you', "we", or "us" to exist, there must be an "outside or background" to contrast against. For example, can there be an "up" without a "down" or "left" without "right"? It is the same with you. There must be something outside of you for you to exist. Without this contrast, it would look like this: !! White font against a white background equals nothing! It is just too easy to get drawn into the scholar's world of Philosophy at this point with the virtually unlimited number of philosophers and texts on this subject. Many philosphers throughout history have undertaken the task of explaining "self" so I will mention just one here for reference, John Locke. *** His description of "self" is: "personal identity consists: not in the identity of substance, but... in the identity of consciousness". So, to put it simply, "I think, therefore, I am". We have been trying to get back home, back to Paradise, back to our True Nature, ever since. There were no bread crumbs dropped leaving a trail back to Source and Ego certainly did not take notes or draw a map, so it is up to each of us to get back. There is one little catch though...most people do not even know that this is an illusion created by Ego and therefore are not even aware they are lost. These people, of which everyone was once one, are Asleep for now and can not understand. This too has been written about by many philosophers over the ages without any sufficient conclusion as far as I am concerned. I think it has to do with the age of and the evolution of the soul or perhaps it is tied to reaching a certain level of wisdom - just speculation. Albeit, if you are reading my blog though, then I am assuming that you have Awakened and are on your Path with Heart. If not.......WAKE UP!!!!! Okay, so here we are on our respective Paths with Heart and seeking the Wisdom to get back home. First, you must realize that you really never left - remember the illusion part. Second, visualize "home" as a radio station that broadcasts only in the Present and you are trying to tune it in. Third, consider that your thoughts of the past and the future are static created by the Ego and they are preventing you from getting a clear signal. Now, relax, let your thoughts quiet down, and "tune" in" CALM Radio. It is the completely silent and peaceful spot on your radio dial between the Oldies station and that new irritating, adrenaline-pumping station that sounds like noise to you but the kids love it. Focus on that perfectly empty space until you can actually feel the stillness inside of your Center. Now, as you are relaxing further and further into that very quiet place, without a thought, just calmly look around. What do you "see"? That is right...it is you, me, your dog, everyone, and everything.............and all you feel is the Infinite Bliss of pure Love. Welcome home! ......................... considered personal identity (or the self) to be founded on consciousness (viz. Memory), and not on the substance of either the soul or the body. 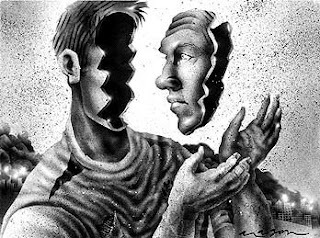 Chapter XXVII "On Identity and Diversity" in An Essay Concerning Human Understanding (1689) has been said to be one of the first modern conceptualization of consciousness as the repeated self-identification of oneself.